A mammogram uses a machine designed to look only at breast tissue. The machine takes an x-ray at lower doses than a usual x-ray. Because these x-rays do not go through tissue easily, the machine has 2 plates that compress or flatten the breast to spread the tissue apart. A mammography exam, called a mammogram, aids in the early detection and diagnosis of breast diseases in women. At Nationwide the quality starts with the selection of the equipment we purchase. Since we perform our own warranties and service, we must select only the best in pre-owned devices so that we can reduce the chance of having after installation service issues. When its time to pick up the mammography equipment, Nationwide crews perform final testing on the system before we power down the unit. These tests are to ascertain the state of the system before it is removed and transported. Once these test are completed, the unit is powered down. The cables are removed and neatly organized, labeled, and packaged. All major components are unbolted from the floor and pad wrapped to protect the exterior of the components. OEM dollies are attached to the base of the major pieces and removed to be own transported by a modern air ride semi trailer. The mammography equipment is buckled down within the trailer for a secure ride. Once the mammography equipment arrives at the Nationwide facility it is again inventoried. The covers of the pieces are removed from the system and tagged as to their location and system number. The covers are taken to the cosmetic repair center. There they will be prepped, masked and painted to the OEM colors or one of the customers’ preferences. The major components are cleaned with a variety of processes that sterilize, cleanse, and prepare these devices for cosmetic’s and operations. There are then moved into a testing bay where they are cabled up and power applied. The system is then again tested to determine if all manufactures mandatory upgrades have been completed. Any items that do not exceed the manufacturers specifications or are close to failing are replaced. 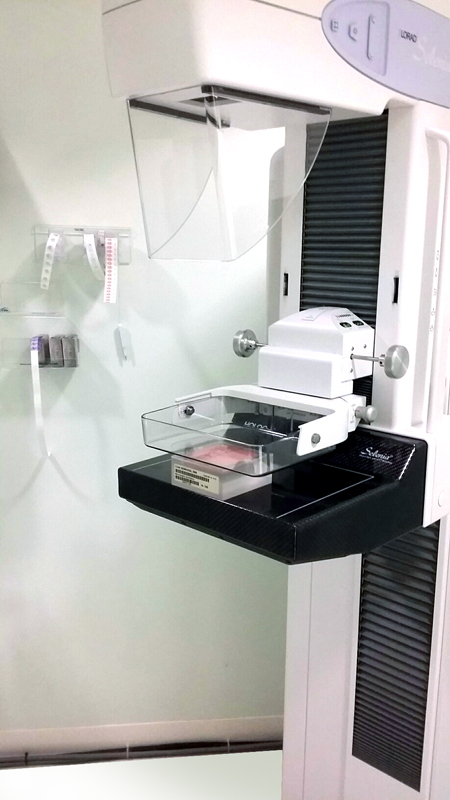 Once the mammography equipment has been thoroughly and completely tested and inspected, the covers are reattached and the system is energized for 24 hours to monitor for system faults under test and heated operations. Once completed the equipment is certified reconditioned. The unit is de-cabled and wrapped for its’ move to a new home. There the mammography equipment will be professionally installed by one of Nationwide’s crews.